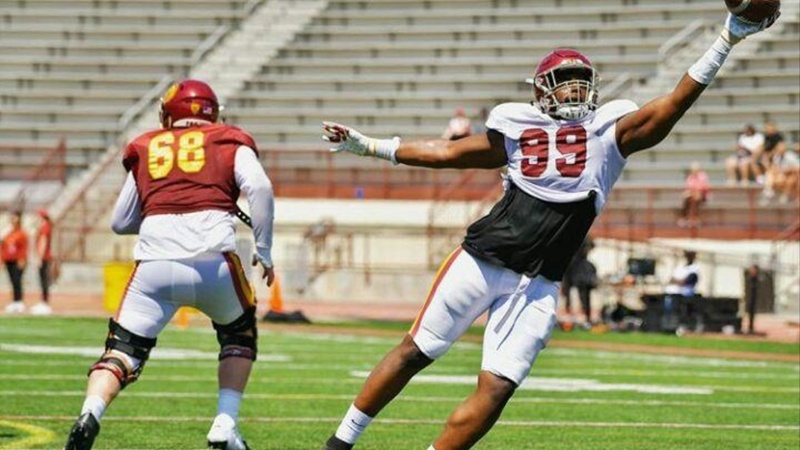 Trojaninsider.com’s Scott Schrader, Josh An And Nate Goldstein share their thoughts on five hot topics from USC Spring Ball 2019. 1. Who are some players that stood out the most? SS: The player who absolutely stood out most to me this Spring was OLB Drake Jackson, But DT Jay Tufele, DT Marlon Tuipulotu and MLB Palaie Gaoteote were right there. I don’t keep stats, I don’t chart plays and whether it’s good or bad, I don’t keep notes during practices (no ghost notes for you). If a player or play doesn’t POP out to me or isn’t memorable without jotting down the play/players, it’s not worth mentioning...for me. I recall the four or five guys above standing out nearly each day. Hunter Echols was also on my mind often with his ability to get in the backfield. Offensively WR Amon-Ra St. Brown was nearly uncoverable at times and caught everything he should. WR Michael Pittman is in the best shape of his career, the work he’s done in the offseason with former USC WR Curtis Conway has obviously paid off. Pittman was extremely solid each day and Isaac Taylor-Stuart got better fast, because of all the reps he got versus Pitt. Definitely need to mention QB Kedon Slovis, because he came in and did not look like a freshman out there. In fact, we could argue he often looked better than Jack Sears and Matt Fink. I don’t want to get carried away with folks thinking Slovis should be the backup, but it was an impressive Spring for the young QB from Scottsdale, AZ. JA: Offensively, I’m going with Amon-Ra St.Brown, Michael PIttman Jr., and Alijah Vera-Tucker. These are three guys we knew the Trojans were going to rely on, and they showed out during the spring period. St. Brown and Pittman consistently dominated the defensive backs in 1-on-1, 7-on-7, and 11-on-11 periods and Vera-Tucker is almost always mentioned as the toughest matchup for the Trojans’ defensive lineman. Speaking of defensive lineman, Jay Tufele and Marlon Tuipulotu are my standout defenders. With USC being so thin in the secondary, it’s going to be imperative that the Trojans have a strong pass rush moving forward and the duo of Tufele and Tuipulotu delivered throughout the spring. These two lived in the backfield and were either getting pressure on the quarterbacks or hitting in the running backs in the backfield on a consistent basis. NG: Drake Jackson is my pick on defense. He had a one-handed pick at the spring game and returned it for a touchdown. Throughout spring practice, he has been seen putting a significant amount of pressure on the quarterbacks and overall, as a true freshman, has performed exceptionally well during spring ball. Offenisvely, Markese Stepp stood out the most to me. Despite stating that he might have only “caught seven passes in all of high school,” Stepp has a done a great job adjusting to the air-raid and practicing catching passes. He stood out this spring specifically during the spring game where he took a handoff from Kedon Slovis 60 yards down the field for a touchdown. 2. USC made several coaching changes in the offseason, which hire, other than Graham Harrell, do you see being the most beneficial so far? SS: I have to agree with Josh about Greg Burns making the biggest impact so far, because the young DBs desperately needed a coach who will put his hands on them, look them in the eye and not tolerate half-assed efforts from the players. There aren’t many DBs at USC with significant playing time, even practice time for some, so Burns did an outstanding job of teaching his guys how he expects things to be done. Quite a few more DBs enroll in June and a few of those dudes will likely play in 2018. CB Jaylen Watson from Ventura College and Jayden Williams are guys I’ve seen and both are very, very talented. Wouldn’t surprise me to see Watson come in and start at one of the CB positions. Adonis Otey‍ and Dorian Hewett‍ are solid DBs and possible special teams stars at some point with their speed and athleticism. All will benefit greatly from Burns coaching them. With recruiting, I think USC fans will see Mike Jinks be a huge factor with the Trojans recruiting RBs and prospects from Texas. He has 22 years prep coaching experience in the Lone-Star State and win a TX State Title for Steele HS in 2010. JA: While I like all of the new hires, I think Greg Burns is going to help the Trojans’ secondary tremendously. Burns’ intensity and drive to hold his players accountable was evident throughout the spring and I think the defensive backs improved tremendously from start to finish. By the 15th practice, guys like Isaac Taylor-Stuart, Dominic Davis, and Chase Williams looked more polished than ever before and were holding their own against USC’s elite wide receiving corps. I’m interested to see what Burns can do with more time and bodies moving forward. NG: Mike Jinks - Running Backs Coach: USC’s new air raid offense has actually increased the utilization of the running backs in comparison to last season. Jinks has done a great job coaching USC backs such as Vavae Malepeai, Quincy Jountti, Stephen Carr, and Markese Stepp to catch passes more often while also protecting the QB when passes are thrown to the WR’s. With USC moving to a more pass-heavy offense, questions have been asked about the status of the run-game, but Coach Jinks seems to be confident that his backs will be extremely dangerous to opposing defenses this season. 3. Of the 10 early enrollees, who was your standout performer? SS: Drake Jackson, But since we mentioned him above, I’ll give the nod to CB Briton Allen. He will contribute this season for the Trojans in my opinion. JA: Drake Jackson would be the easy(and very deserving) choice here, but I’m gonna choose Kedon Slovis. Quarterback might be the most difficult position in sports and Slovis’ poise and command of the offense as a freshman despite having three more experienced quarterbacks around him was extremely impressive. I’m not saying he’s going to win the starting job, but USC definitely has a player in Slovis. NG: Kedon Slovis has received a significant amount of reps in both 11vs11s and 7vs7 scrimmages throughout both spring ball and the spring game. Slovis, who was a three star-QB prospect and did not start as QB at Desert Mountain High School in Scottsdale, Arizona until his junior year, has established himself as a legitimate contender for the starting QB job. USC Offensive Coordinator Graham Harrel has stated that he has been “really really shocked with how quickly he’s picked it up [and] how well he’s played.” Since Harrell’s new offensive scheme has allowed Slovis to come into spring practice on an even playing field with the other QB’s, Slovis has definitely been able to prove his skills in spring practice. 4. Question marks moving forward for the Trojans? SS: The depth on the OL and the inexperience with the DBs will be questions marks heading into Fall Camp. But the Trojans have four guys on the OL with experience, talent and time with the program. There’s virtually no way for us to know how the OL will look heading into the season, but they all feel Tim Drevno has made a big impact in a short amount of time. He’s also doing extremely well recruiting early on. Although the DBs are relatively inexperienced and extremely young, I believe they are the most talented group USC has had at DB in many years. These guys are hungry too, which I believe was a missing element throughout the team in 2018. It seemed as though too many guys felt like making it to USC was the prize. The Trojans need guys viewing USC as a temporary stop on their path to something far greater. Too many players were too comfortable. I think there been a significant shift away from that mindset. JA: Defensive back and offensive line depth is going to be an issue, but USC also has a predicament at linebacker. Clancy Pendergast moving to more of a 4-3 defense, leaves guys like Hunter Echols and Abdul Malik-McClain playing more SAM and shifts Kana’i Mauga and Juliano Falaniko inside to middle linebacker. While all of these players are talented and made plays at their respective spots, they’ll need to adjust and minimize their mistakes in a season where there won’t be any margin for error. NG: Coach Helton emphasized his attempts to increase the team’s discipline as a result of USC finishing as one of the most penalized teams in the nation last season. With the presence of Pac-12 refs at practices, Coach Helton has stated that they have “made us a more disciplinedfootball team over 15 practices.” As the new season quickly approaches, how will this disciplinetranslate from spring practices to the high-pressure atmospheres against real opponents this season? 5. If USC had a game today, who would be your starting quarterback? SS: I didn’t see anything in the 13 practices I attended that would lead me to believe JT Daniels won’t be the starting QB. I do think it will be a battle for the No. 2 spot and I have no idea who’d be most qualified for that gig after Spring Ball. JA: All of the quarterbacks had their moments throughout the spring, but I didn’t see anything that would lead me to believe JT Daniels is going to be dethroned as the starter. Daniels made his fair share of mistakes and will need to show Graham Harrell he can maintain tempo, but he still has the highest ceiling of the Trojans’ current quarterbacks and gives them the best chance to will ball games. NG: JT Daniels: Many of the issues JT Daniels had last season were a result of bad offensive playcalling and several snapping issues. Despite USC’s less than stellar offensive performances last season, if USC were to have a game today, JT Daniels would be my choice for the starting QB job. With the majority of last season under his belt and 15 more spring practices, JT Daniels is still the most talented and experienced QB on the roster and his increasing chemistry with USC’s unmatched receiving core will prove extremely efficient this fall.